The more I use Mr Color, the bigger a fanboy I become. Today I just shot the missiles, pylons and drop tanks with Mr Color both gloss white and Insignia White - smooooooth as silk - just can't ask for more. Since I missed the two contests, I decided to order the Quickboost seats for the balance of the build and display. If I make to to next years contest(s), I'll switch seats. I'll need to give Mr Super Clear GX100 a try and see how it compares to Mr Color to Mr Color Gloss Clear 46. Looking forward to seeing your Tomcat. 32nd scale Tomcat or F4? Good question; Tomcat (I think). For the F-4, I have VF-84 decals, for sure (as well as others), and have had them for a very long time now. Coming along very nicely indeed! Like the marking option you went with. I guess we'll have a 1/48 Tamiya F-14D some time this summer as well! Very much appreciated and no question the Super Tomcat will be here maybe by the fall. 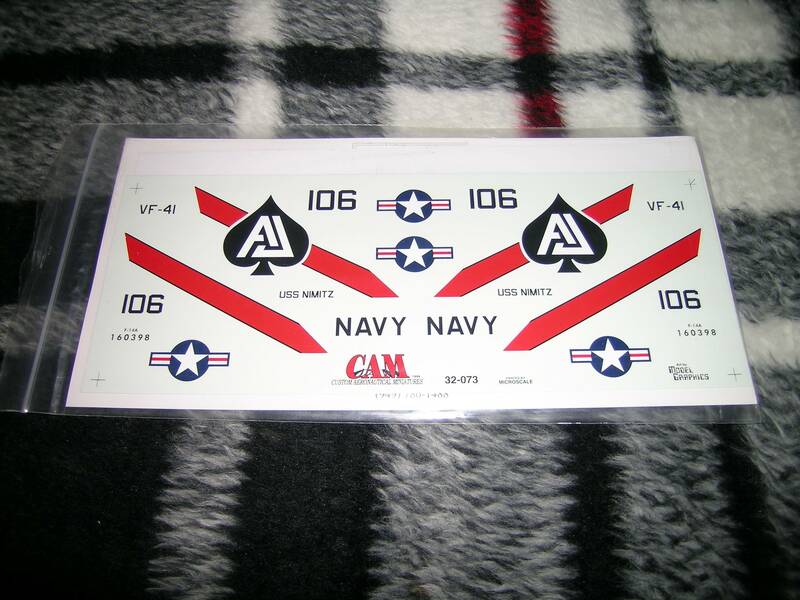 Hopefully there will be new AM decals coming our way and I'll be adding the F-14D to the collection. Yep, definitely Tomcat, Peter. I just found this image, which I'd completely forgotten about, while searching for another photo. Decals look spot on and it's really nice to find a set in the stash. Can't wait to see the Big Cat underway. Been plugging away and all the missiles, drop tanks and pylons are now painted each the appropriate gloss white, ready for clear gloss and decaling with a zillion small decals: yikes! Even started the gear late last night and it feels great to be at the bench, making enjoyable and relaxing progress. Been plugging away and all the missiles, drop tanks and pylons are now painted each the appropriate gloss white, ready for clear gloss and decaling with a zillion small decals: yikes! Even started the gear late last night and it feels great to be atthe bench, making enjoyable and relaxing progress. It is a hobby after all Peter, and to me that is, along with life, the main goal..................enjoy yourself!